Size: Approx. 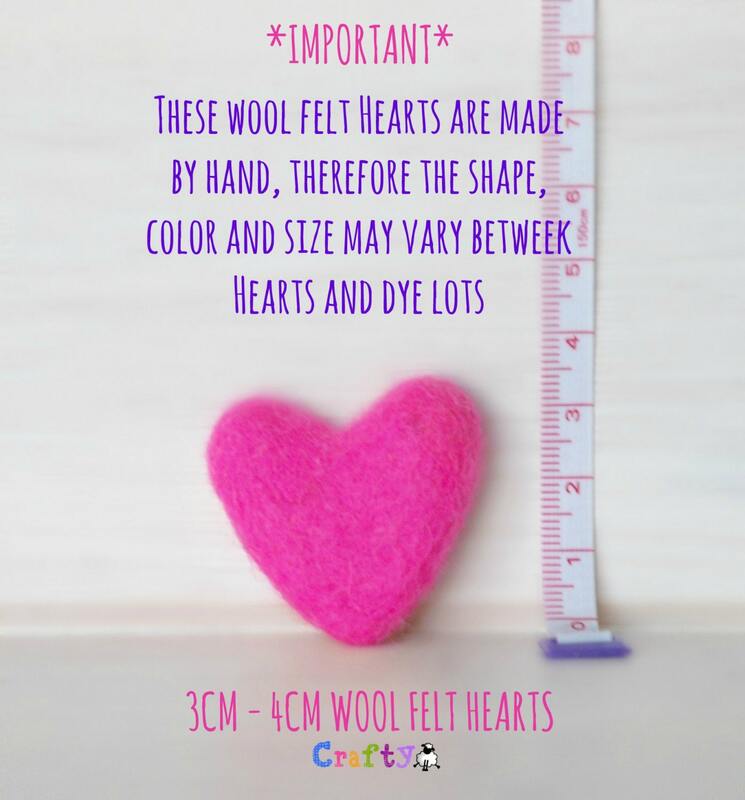 3-4CM by 3.5-4CM (being handmade, there is naturally a variation in size within colors; also, some colors tend to be slightly larger or smaller than other colors). check out! See color chart shown in image #5. If no colors are picked, I will send random colors. ➳ Rainbow Pack: 15 Hearts - 1 of each color: Pea Green, Apple Green, Celeste, Peacock, Sky Blue, Cobalt, Soft Lilac, Amethyst, Neon Pink, Fuchsia, Yellow, Marigold, Tangelo, Red and Dark Red (If a color is out of stock, I will pick another color for your pack). 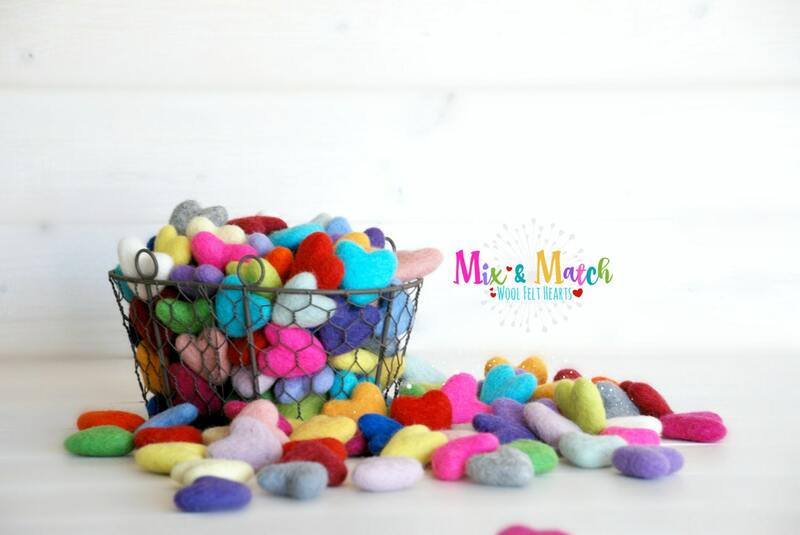 ➳ Sampler Pack Includes: 32 Felt Hearts - 1 Heart of each color shown in image #5 (If a color is out of stock, I will double a color). 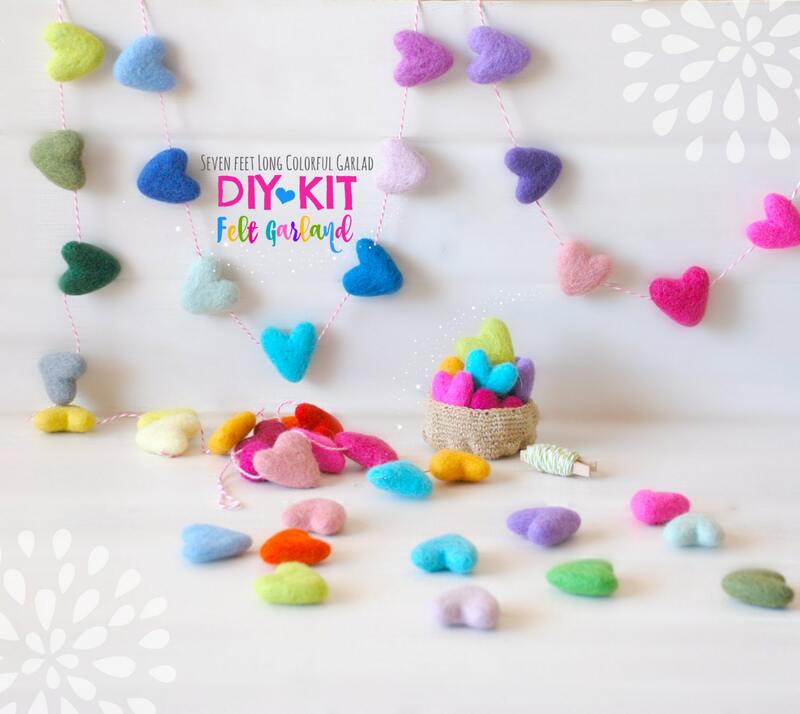 These cute felted hearts are so much fun and are great for making heart garland, ornaments, gift tags, mobiles for babies, brooches, also can be use as jewelry. 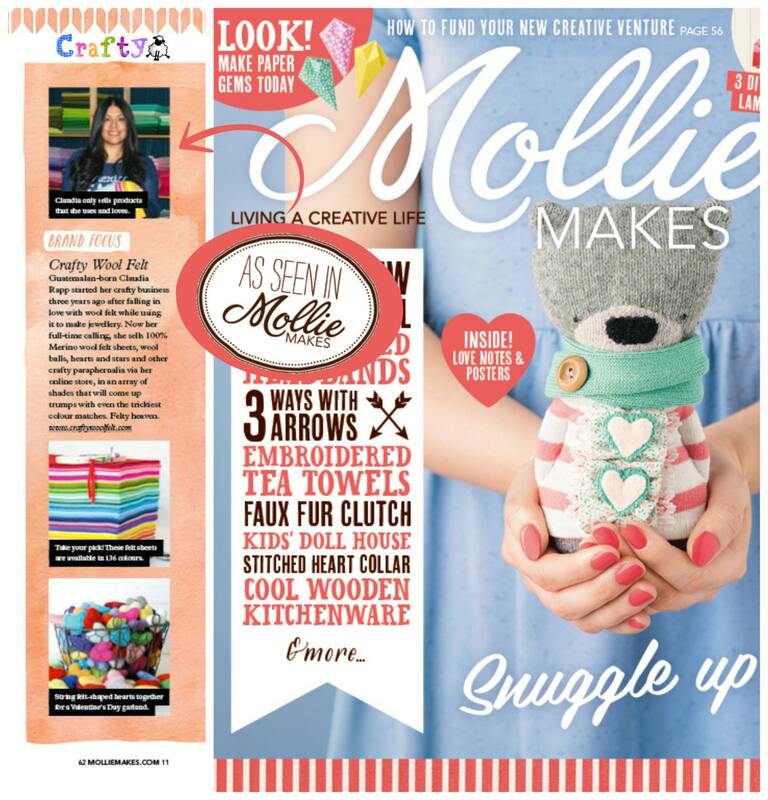 String them together to decorate a room or add some stitches as well! Perfect for DIY project for kids. Please refer to image #5 to see the colors available, ZOOM IN to read colors better. It is very important that you know that each Heart has been made by hand, therefore there are no identical Hearts. Each has its own character and that is what is cute about them. 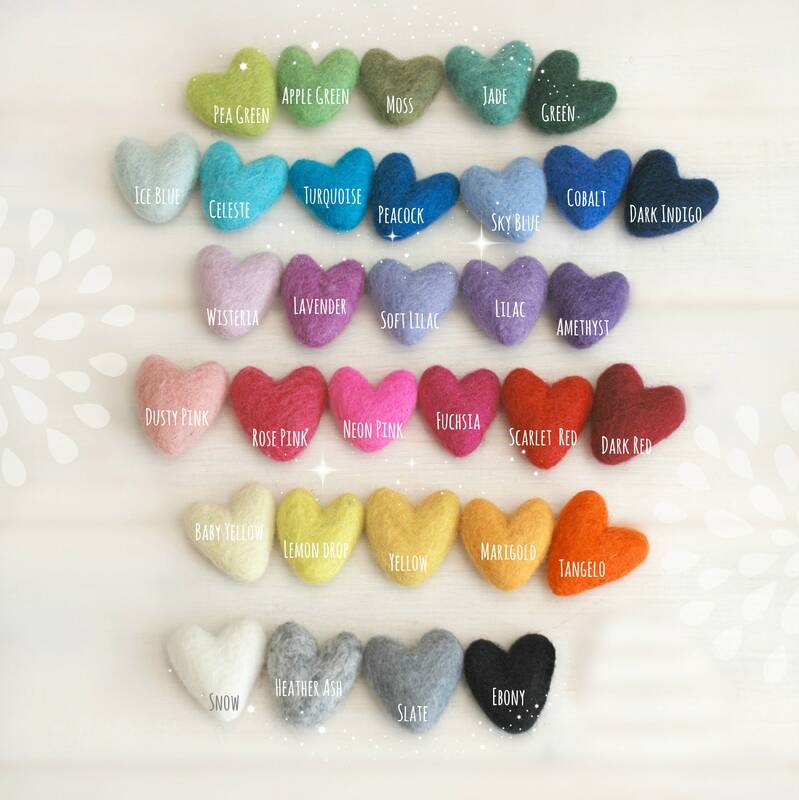 These lovely felt hearts are 100% Handmade in Nepal and are dye with Azo-free dyes. - I try my best that the colors in the pictures represent the colors of the actual product as close as possible. However to do photography as well as monitor color settings a slight differences can occur. Purchasing my color chart is the best way to ensure a close match. - I do all my felt cutting and I make sure to cut generously. You will never receive less than specified in the product description. Jade is darker and Ice Blue looks more mint IRL. Other than that, they're really cute! Great seller, vibrant colors, and fast shipping! !